Native Berkeleyite Laurie's songwriting, fiddling, and crystal-clear singing have brought her national recognition, a Grammy, and two International Bluegrass Music Association Awards for Female Vocalist of the Year. Through her many band and solo outings, Laurie has become a key figure in bluegrass, traditional, and folk music circles. 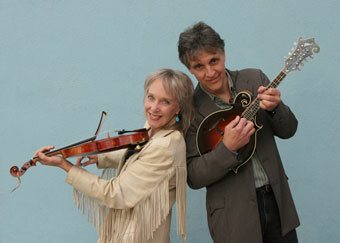 Tom, a native New Englander, began his collaboration with Laurie when he added his mandolin, mandola, guitar, vocal talent, and wry humor to Laurie's Grant Street String Band. Bursting out of Portland, Oregon's burgeoning old-time scene, Foghorn Trio plays old time string band music deeply rooted in the American folk tradition, with Stephen "Sammy" Lind's fiddle and Caleb Klauder's mandolin playing the intertwining lead lines, supported by the bass of Nadine Landry. 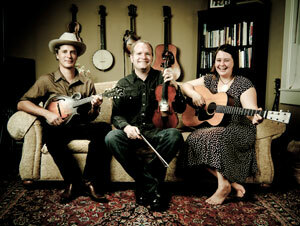 It's a sound that could be coming to you from a big console radio in a 1930′s living room, or an Appalachian front porch, but the Foghorns put their own stamp on it, carried along by their driving rhythms and fierce determination to keep traditional music alive and exciting for this and future generations.